In a fiery game similar to Halloween's Snap-apple HERE, brandy and raisins in a shallow bowl were set afire. Then folks grabbed the flaming raisins to put in their mouths. 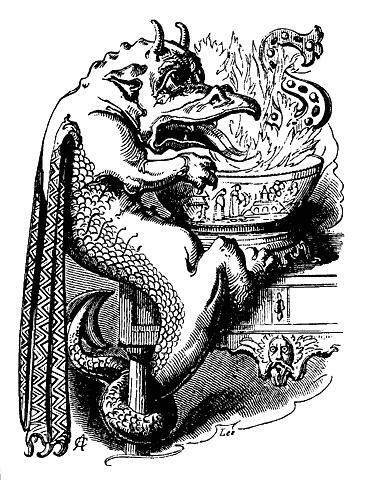 "…the long table upon which stood an immense, shallow earthen dish—such as Mrs. Thorndrake used to make batter puddings in - strewn pretty thickly with raisins detached from the stalk... [added] a pint or so of brandy, and then... sprinkled the brandy and raisins plentifully with salt, after which, suddenly lighting a lucifer match he set fire to the spirits and in a moment the flame spread over the dish. ...“Snap-Dragon” was capital fun, but that burnt raisins were very nice eating also, in spite of the salt and brandy in which they had been soaked." However, it may soon be decided which definition is the most perfect. The sport affords much fun in a darkened room ; not the least of which is the spectral appearance of the young players from the spirit flame." "One favourite Christmas sport, very generally played on Christmas Eve, has been handed down to us from time immemorial under the name of 'Snapdragon.' To our English readers this amusement is perfectly familiar, but it is almost unknown in Scotland, and it seems therefore desirable here to give a description of the pastime. A quantity of raisins are deposited in a large dish or bowl (the broader and shallower this is, the better), and brandy or some other spirit is poured over the fruit and ignited. 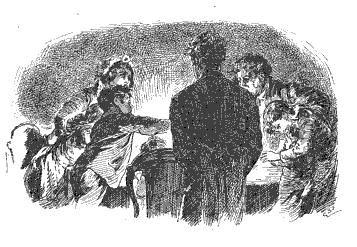 The bystanders now endeavour, by turns, to grasp a raisin, by plunging their hands through the flames; and as this is somewhat of an arduous feat, requiring both courage and rapidity of action, a considerable amount of laughter and merriment is evoked at the expense of the unsuccessful competitors. As an appropriate accompaniment we introduce here"
Though he looks so fee! fa! fum! 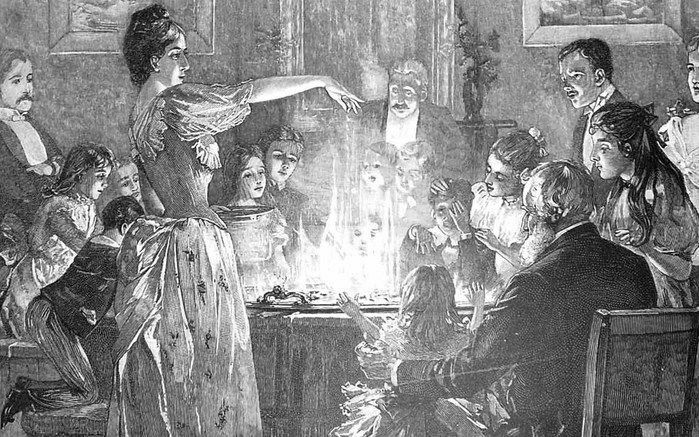 "Whilst the sport of Snapdragon is going on, it is usual to extinguish all the lights in the room, so that the lurid glare from the flaming spirits may exercise to the full its weird-like effect. There seems little doubt that in this amusement we retain a trace of the fiery ordeal of the middle ages, and also of the Druidical fire-worship of a still remoter epoch."